Got a DMGAudio account? Then TrackControl is yours for free. DMGAudio has unveiled the Track range, a suite of plugins designed to assist in various parts of the production process. At £35 each, four of them are affordable, while one is free for anyone with a DMGAudio account. 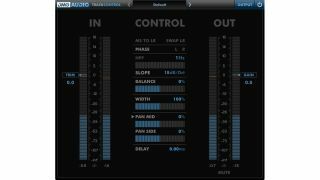 The freebie goes by the name of TrackControl, and is described as a fully equipped stereo toolkit. Features include M/S encode and decode, M/S and L/R panning and stereo width control. Moving on, TrackDS is designed to "surgically and invisibly control sibilance," automatically detecting problem areas and operable with one click. TrackGate offers "state of the art gating and expansion," while TrackLimit is "a fully featured wideband limiter with intelligent dual-stage handling of transients and dynamics". Finally, there's TrackMeter, a FFT spectrum analyser that comprises a set of fully resizable graphs. All the plugins are available in VST/AU/AAX formats, and you can download demos, too. Find out more on the DMGAudio website.